The Union Minister also asked the Congress to answer for Omar Abdullah's assertion in this regard. Rajnath Singh said no culprit would be spared in the centre's war against terrorism. Union Home Minister Rajnath Singh today warned that the government will have no option but to do away with Articles 370 and 35A if "somebody" talks about having a separate Prime Minister for the troubled state. The two provisions in the constitution provide special status to Jammu and Kashmir, and prevent outsiders from settling down or purchasing property in the state. Rajnath Singh was referring to National Conference leader Omar Abdullah's recent promise to work hard towards restoring autonomy for Jammu and Kashmir, so that it can have a separate Sadar-e-Riyasat (President) and Wazir-e-Azam (Prime Minister). The warning, made at an election rally in Jammu and Kashmir's Suchetgarh, came in the wake of the BJP expressing its "commitment" to annulling Articles 370 and 35A in the party manifesto released earlier today. 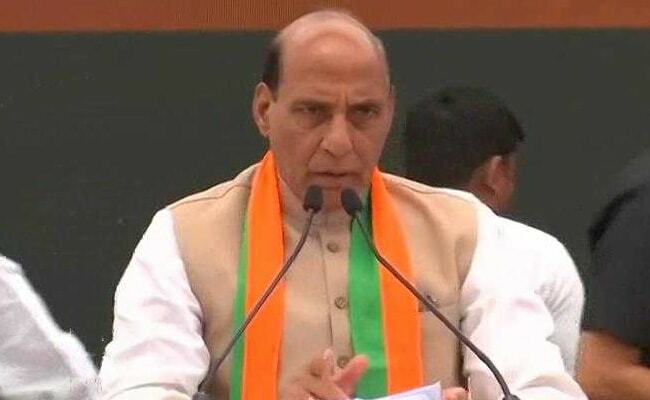 "If someone talks about a separate Prime Minister for Jammu and Kashmir, we will have no option other than to abolish Article 370 and Article 35A," news agency PTI quoted Rajnath Singh as saying. He also asked the Congress - which is in an alliance with the National Conference - to clarify on Mr Abdullah's assertion. The National Conference leader had stated at an election rally in Bandipore earlier this month that those threatening to scrap the two provisions should know that unlike other states, Jammu and Kashmir had negotiated the terms and conditions of its accession with India in an attempt to secure "its own identity and constitution". "Back then, we had bargained for our Sadar-e-Riyasat and Wazir-e-Azam, and God willing, our party will bring it back," he said. The comment drew a furious response from Prime Minister Narendra Modi the same day. "He says we will take the clock back and replicate the situation before 1953 and there will be two Prime Ministers in India. That Kashmir will have its own separate Prime Minister," he said, adding that the Congress should explain why its ally could say such a thing. Mr Abdullah clashed with many others, including cricketer-turned-politician Gautam Gambhir, on the issue in the days that followed. In his address, Rajnath Singh said that no culprit would be spared in the centre's war against terrorism. "If someone takes up arms against us, we will go to whatever extent required to give them a befitting reply," he added.